ah, i miss Penang and its durian, its has been 2 month that I didn’t go back there liao.. 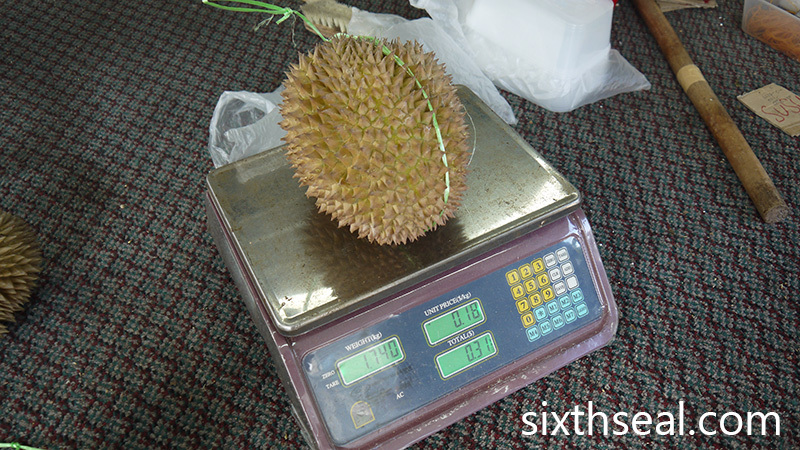 It has consistently produced awesome durians, from D175/Red Prawn/Udang Merah/Ang Heh to Black Thorn/Ochee/Duri Hitam. Wow, this is the first time I’ve heard of Durian Susu. It does look creamy too. I ate a lot of durian in my childhood days, I kind of get turned off by them now as I preferred tempoyak. I headed there to eat this Susu Durian too. There were 25 pax of us, all family, and some of the uncles said they wanted to eat durian too but I was the most committed one. I didn’t talk much, just went to search and destroy (with my tummy). Haha. 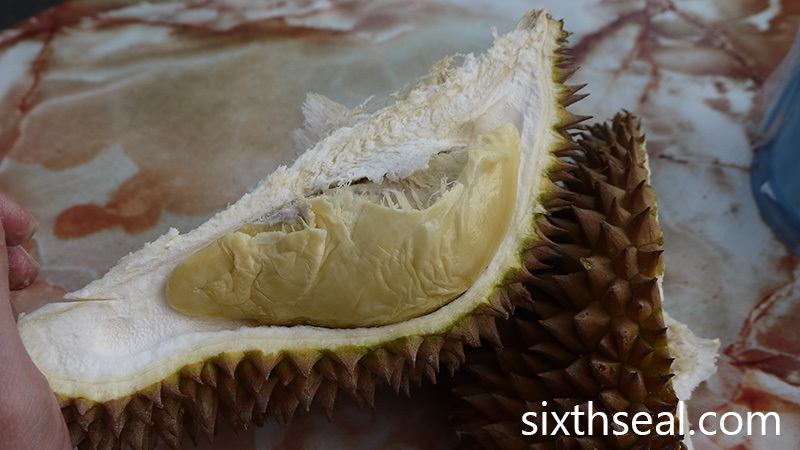 You need to eat close over 300 durians to get through the most common durio zibethinus species (number might be closer to 400-500) and that’s not counting other species like our Sarawak/Sabah Borneo jungle durians. There’s a lot of durians to eat, and hybrids are being bred all the time, like the D144 (hybrid of D2 and D24) which I just got to sample this year. I love milk and I love durian, although milky durians aren’t always the best ones. 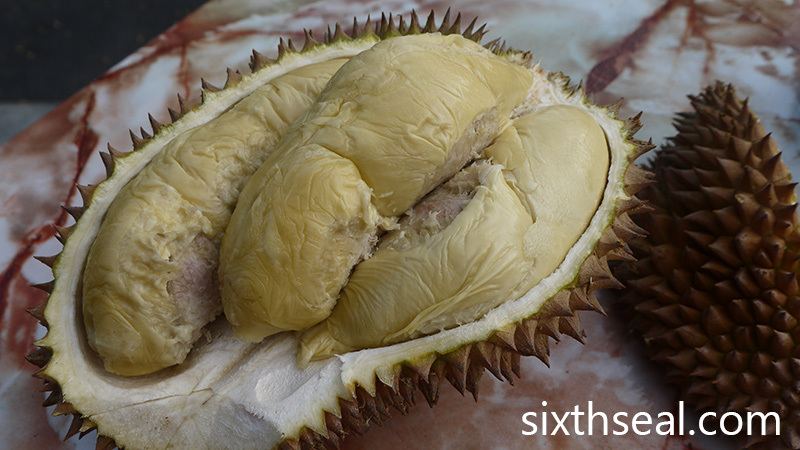 I prefer durians with more character and some days you like sweet ones, some days you’re looking for a bitter profile, some days you want a creamy durian, some days you want fibre in your durian so there’s one for every day. 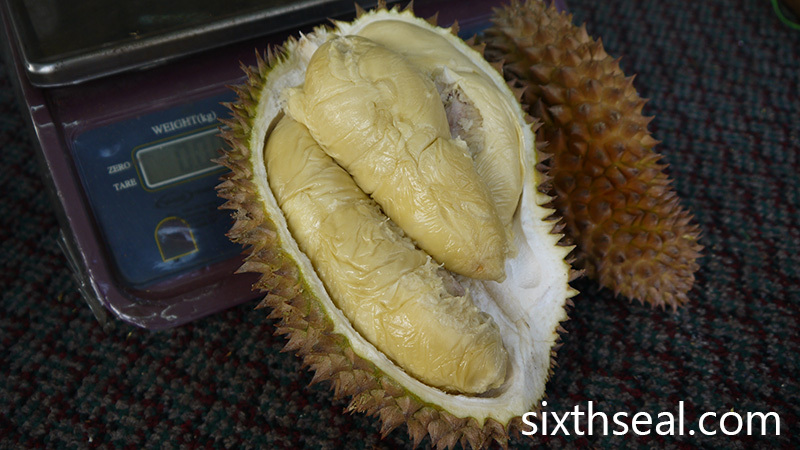 Have never heard of this Susu Durian but I love bitter flesh durians. wow susu durian! this is my first time hearing and seeing this. probably i had them before but never knew. Really excited to try them. It’s near the end of the season though, but some breeds are still coming out – D24, D101, D88, Musang King etc. The early season durians like D13 are all gone though. 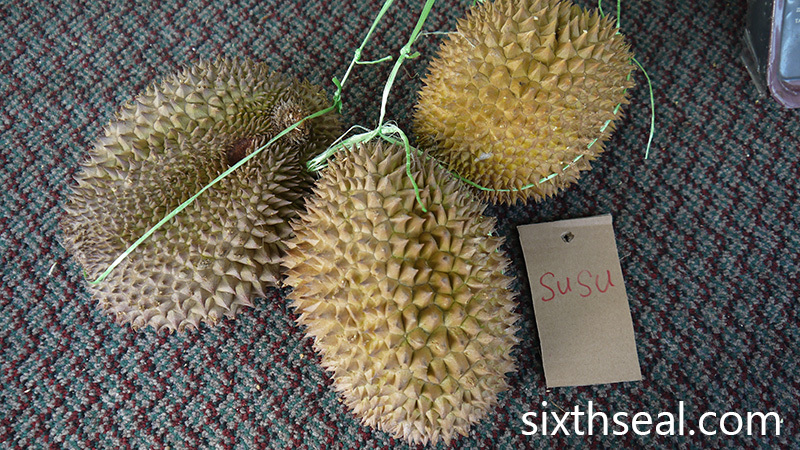 Hmm…you have to specifically ask for Susu Durian, it’s hard to get these durians outside of Penang. I waded through a 5.4 kg D159 Monthong all by myself in the span of 24 hours. 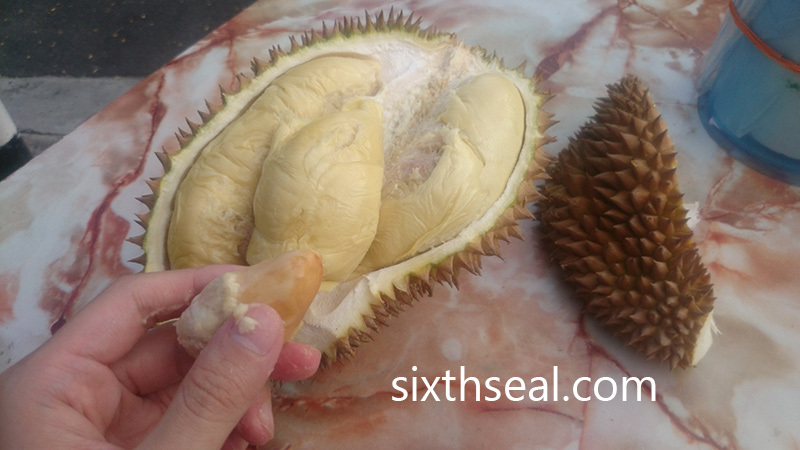 It was all that I ate – no other food except that gigantic durian. Haha. It’s not red as in “orange” but red as in lipstick solid red, a rouge-magenta shade that’s so deep it’s almost unreal. It’s our Sarawak (and Sabah) Borneo jungle durians and it’s quite good. The season just started over there, the timing is slightly different coz there’s a sea in between. I have eaten some durian kampung that tastes like milk too with no fiber at all but I guess must try Penang durian susu to know the difference. Your Durian post is killing me because I need to wait till the weekend to see whether there are any more durians left for me to buy and eat.